We arrived late on route to catch a ferry in northern France to England, however our host prepared us a delightful duck breast salad and the most divine strawberry cheesecake we have ever tasted. Do have the cake! 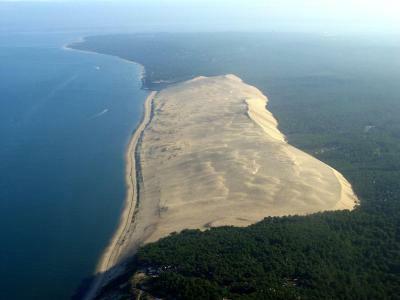 Although this was a short stop over we will be back to stay for a longer period thanks to the splendid hospitality and explore this great region of France. It was an adequate room, only missing a feminine colourful touch. The position of the hotel is good for a stopover. The bed was comfortable. We are able to stay with our dog. For a night before or after a flight its ok but like many budget airport hotels it has no personal touch and you feel like you want leave this place as fast as possible. Good choice for an overnight stay traveling North - South. Close to the high way so in the morning you can leave the traffic jam on Bordeaux's ring road behind you. Comfortable beds. parking was good and secure room was ok for what we wanted. It was close to main travel route. The food was nice. The locality of the hotel made it a perfect stopover when travelling to Spain. 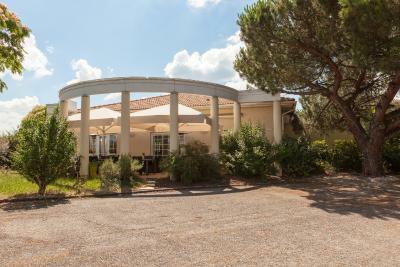 Hotel The Originals Bordeaux Sud Le Cottage d'Amphitryon (ex Inter-Hotel) is located in a quiet setting on the southern outskirts of Bordeaux on the Bordeaux/Arcachon/Spain road and offers comfortable and affordable accommodations. The hotel is 650 feet from the motorway. The air-conditioned guest rooms are equipped with private bathrooms, a flat-screen TV with satellite channels and free WiFi internet access. Tea and coffee making facilities are also available in rooms. 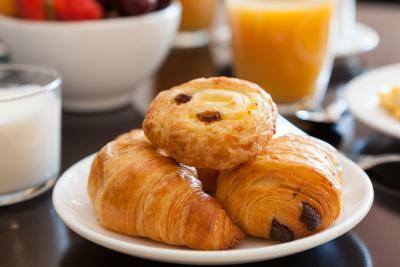 A buffet breakfast is available every morning and can be enjoyed on the hotel's terrace. 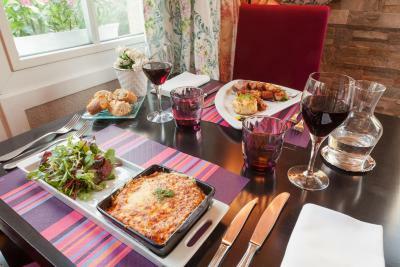 Guests can also sample traditional, regional cuisine in the hotel's air-conditioned restaurant with al fresco dining, which is open from Monday to Thursday. 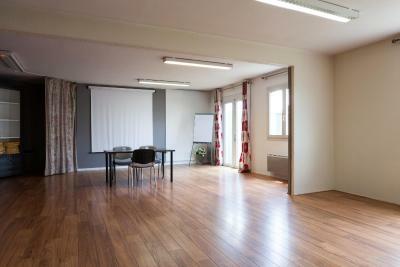 Free secured parking is provided on site and the center of Bordeaux is just a 20-minute drive away. Bordeaux-Mérignac Airport is 8.1 mi from the property. 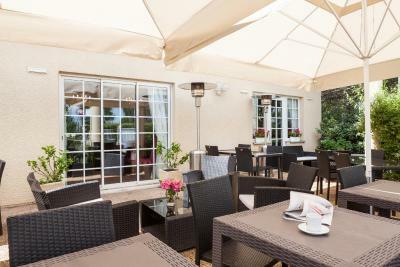 When would you like to stay at Hotel The Originals Bordeaux Sud Le Cottage d'Amphitryon (ex Inter-Hotel)? Air-conditioned room with a flat-screen TV, satellite channels and facilities for making hot drinks. This room is made up of 2 communicating rooms. Welcoming you, naturally... Inter-Hotel is the very image of diversity, just like the regions where our hotels are located. An unbeatable variety of hotels that are all different, comfortable and friendly; places you want to stay when travelling on business or for pleasure. Our managers are never lacking in inspiration or creativity when it comes to welcoming you and keeping you happy with quality services in a setting where you just feel good. Welcoming you, naturally… it’s what makes us different. House Rules Hotel The Originals Bordeaux Sud Le Cottage d'Amphitryon (ex Inter-Hotel) takes special requests – add in the next step! Hotel The Originals Bordeaux Sud Le Cottage d&#39;Amphitryon (ex Inter-Hotel) accepts these cards and reserves the right to temporarily hold an amount prior to arrival. Hotel The Originals Bordeaux Sud Le Cottage d'Amphitryon (ex Inter-Hotel) accepts these cards and reserves the right to temporarily hold an amount prior to arrival. Please note the restaurant is closed for lunch. Guests arriving outside the reception opening hours can call a hotline to get keys instructions. Please inform Hotel The Originals Bordeaux Sud Le Cottage d'Amphitryon (ex Inter-Hotel) of your expected arrival time in advance. You can use the Special Requests box when booking, or contact the property directly using the contact details in your confirmation. The restaurant was closed and there is nowhere to walk to to eat. Cats in the dining area. No food on Sunday in or around the hotel. About the hotel itself I do not have anything to say about it: location, cleanliness, comfort, decoration, etc. 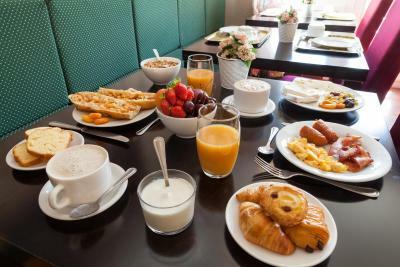 for all this I recommend the hotel, however the price shown on the booking site (Booking.com) and the price charged at the hotel had a huge difference, so I recommend that to avoid less pleasant surprises, before booking confirm the price directly with the hotel. I booked a triple room for one night at the price of € 68.00 and paid € 98.00 when I arrived at the hotel. I did not like. Hotel room needs an update. The room was very small along with the bathroom it maybe because we have dogs so not one of their better rooms was allocated to us. The grounds of the hotel need lots of attention if they tidy it up it could be really lovely. The decor was very dated, the disabled room was very small and to make it worse they had used up space by putting a spare single bed in the room. The disabled shower area did not drain away so there was water everywhere. Very dangerous when on crutches. The room was very tired. We presumed that we were allocated the room as we had our dog. The shower was small and the door on the bathroom was a folding door. The lights above the headboard didn't work.